Drury Walker was an unsuccessful career criminal who took on an even more unsuccessful career as a costumed villain. What he became was a joke, both to his fellow criminals and the crime fighters alike. Disgusted with being laughed at, Killer Moth made a deal with the demon Neron for greater power in exchange for his soul... powers that changed him into the fierce, half-man/​half-insect, all-mad Charaxes! Sculpting Charaxes probably would have required enough tooling to warrant a build-a-figure, so instead, Mattel and the Four Horsemen decided to go with Killer Moth's original look instead, when he'd merely set himself up as an "anti-Batman," complete with a Mothcave, a Mothmobile and even a Mothsignal. He would respond to criminals' requests for aid, just as Batman would respond to the police (the difference being that Moth charged a percentage of the take for his services). 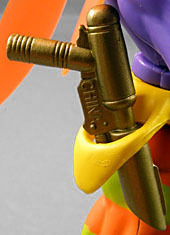 While most of the body is one of the same two or three male bodies we're used to seeing with DCU Classics, KM's unique tooling can be found on his head, belt, and wings. The head and wings are accurate to his Silver Age look, and while the belt doesn't match the particular image we found, it may very well match some other drawing of KM from a different comic. The wings are attached to the back via a big, ugly purple block. However, I've never read a comic with the original KM in it, so for all I know this is what they looked like. KM looks like one of Willy Wonka's hired goons. The chest and arms are molded in light purple with no shade problems, while the legs are orange with yellow stripes. The paint has been well applied on my figure, and the chest symbol is very clean around the edges. The wings are made from very stiff, strong plastic, so they didn't bend inside the package. However, the tiny little antennae on the head did - they were going in all directions. Fortunately, a quick dip in boiling water, a little straightening, and a dip in cold water fixed them right up. 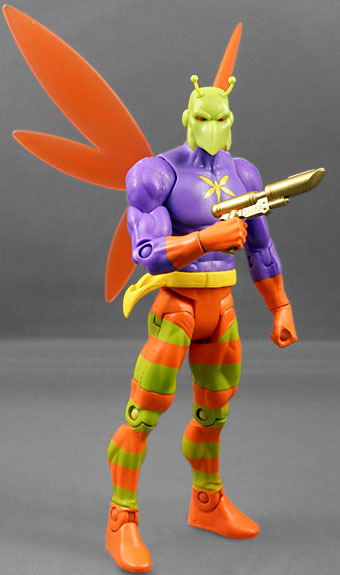 Killer Moth has the standard DCUC articulation, which means no joints in the wings. Of course, since they're just costume elements, they shouldn't be moving anyway. 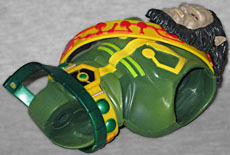 KM comes with his "cocoon gun," which can be holstered in the loop on his belt. Other than the big "CHINA" etched on the side, it looks good. [Maybe he actually bought it from China? --ed.] It can be held in either hand, and will fit in the holster with the grip facing either forward or back, depending on which way you want him to draw it. Of course, he also comes with a piece of Kalibak, the Series 6 Build-A-Figure. In fact, he has the largest piece, the entire head and torso. There are lots of Kirby-style "circuit" details both on the chest and on the separate sash that runs over the shoulder. The piece isn't as intimidatingly huge as some others, but it's still obvious this is going to be a bulky figure once he's assembled. 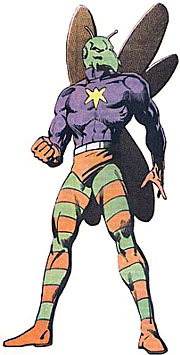 Other than the aforementioned antennae issue, my Killer Moth was great. His left shoulder was stuck initially, but came loose with a little force. However, he was actually the second KM I'd gotten - the first had a small burn mark on his right pec, as if someone had put him down briefly on a hot surface and it had melted. KM runs the usual $12, but given the inclusion of the Kalibak piece, it's a relatively fair price these days. 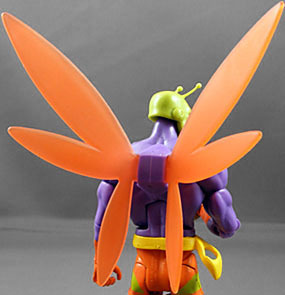 Killer Moth is a fairly standard figure, but his wings push his rating up a little higher. If you're not building Kalibak and have no interest in the character, he doesn't have too much to recommend him (unlike, say, Hawkman with his articulated wings and multiple weapons). However, he's a great example of just how deep into the DCU Mattel is willing to go with this line.